At WWDC 2018, Apple designers presented a talk titled “Designing Fluid Interfaces”, explaining the design reasoning behind the gestural interface of iPhone X.
It’s my favorite WWDC talk ever—I highly recommend it. The talk provided some technical guidance, which is exceptional for a design presentation, but it was pseudo-code, leaving a lot of unknowns. Some Swift-like code from the presentation. If you try implement these ideas, you might notice a gap between inspiration and implementation. My goal is to bridge this gap by providing working code examples of every major topic in the presentation. The eight (8) interfaces we will create. Buttons, springs, custom interactions, and more! A brief summary of the “Designing Fluid Interfaces” talk. Eight fluid interfaces, the design theory behind them, and the code to build them. Applications for designers and developers. A fluid interface might also be called “fast”, “smooth”, “natural”, or “magical”. It’s a frictionless experience that just feels “right”. The WWDC presentation talks about fluid interfaces as “an extension of your mind” and “an extension of the natural world”. An interface is fluid when it behaves according to the way people think, not the way machines think. Apps can be closed during their launch animation. The interface immediately reacts to the user’s input, can be stopped at any point in the process, and can even change course midway. Why do we care about fluid interfaces? Fluid interfaces improve the user’s experience, making every interaction feel quick, lightweight, and meaningful. They give the user a feeling of control, which builds trust with your app and your brand. They are hard to build. A fluid interface is difficult to copy and can be a competitive advantage. For the remainder of this post, I will show you how to build eight (8) interfaces which cover all the major topics in the presentation. Icons representing the eight (8) interfaces we will build. This is a button that mimics the behavior of buttons in the iOS calculator app. Can be tapped rapidly even when mid-animation. User can touch down and drag outside of the button to cancel the tap. User can touch down, drag outside, drag back in, and confirm the tap. We want buttons that feel responsive, acknowledging to the user that they are functional. In addition, we want the action to be cancellable if the user decides against their action after they touched down. This allows users to make quicker decisions since they can perform actions in parallel with thought. 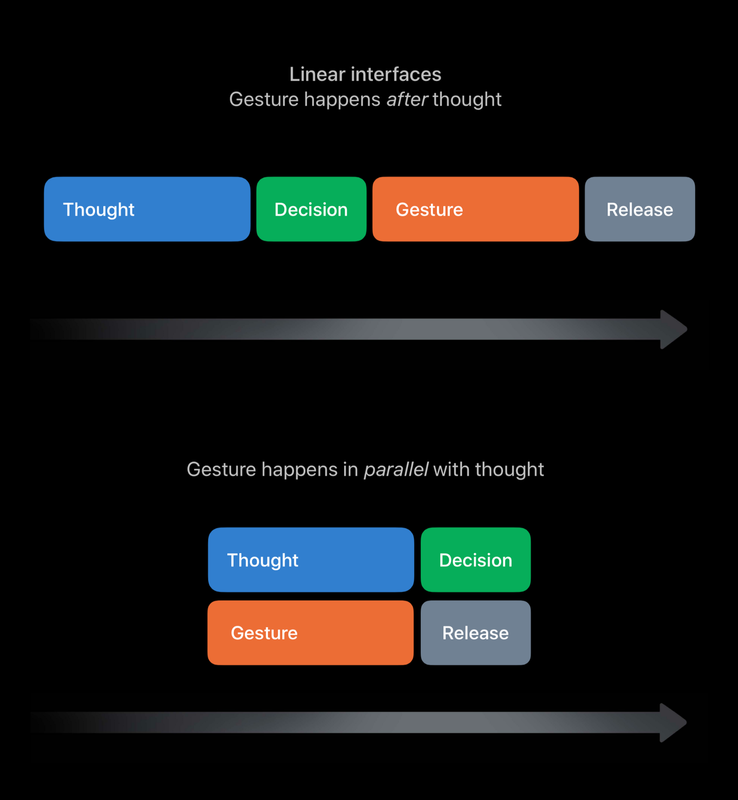 Slides from the WWDC presentation showing how gestures in parallel with thought make actions faster. The first step to create this button is to use a UIControl subclass, not a UIButton subclass. A UIButton would work fine, but since we are customizing the interaction, we won’t need any of its features. Next, we will use UIControlEvents to assign functions to the various touch interactions. We group the touchDown and touchDragEnter events into a single “event” called touchDown , and we can group the touchUpInside, touchDragExit, and touchCancel events into a single event called touchUp. This gives us two functions to handle the animations. On touchDown, we cancel the existing animation if needed, and instantly set the color to the highlighted color (in this case a light gray). On touchUp, we create a new animator and start the animation. Using a UIViewPropertyAnimator makes it easy to cancel the highlight animation. This interface shows how a spring animation can be created by specifying a “damping” (bounciness) and “response” (speed). No concept of animation duration. Springs make great animation models because of their speed and natural appearance. A spring animation starts incredibly quickly, spending most of its time gradually approaching its final state. This is perfect for creating interfaces that feel responsive—they spring to life! Springs don’t have to be springy. Using a damping value of 1 will create an animation that slowly comes to rest without any bounciness. 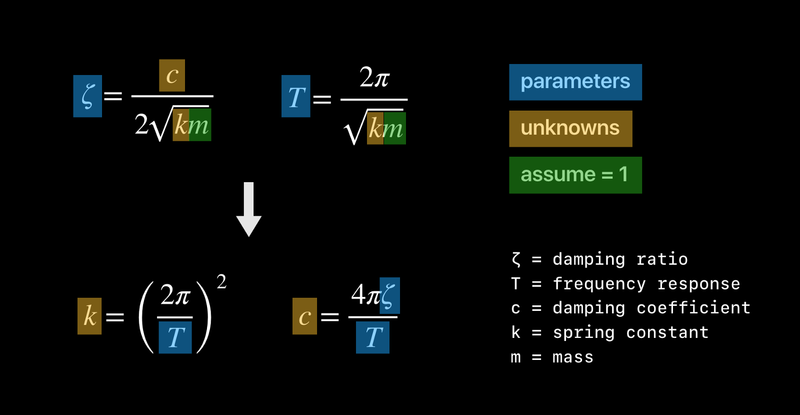 Most animations should use a damping value of 1. Try to avoid thinking about duration. In theory, a spring never fully comes to rest, and forcing a duration on the spring can cause it to feel unnatural. Instead, play with the damping and response values until it feels right. Interruption is critical. Because springs spend so much of their time close to their final value, users may think the animation has completed and will try to interact with it again. In UIKit, we can create a spring animation with a UIViewPropertyAnimator and a UISpringTimingParameters object. Unfortunately, there is no initializer that just takes a damping and response. The closest we can get is the UISpringTimingParameters initializer that takes a mass, stiffness, damping, and initial velocity. We would like to create a convenience initializer that takes a damping and response, and maps it to the required mass, stiffness, and damping. Solving for the spring constant and damping coefficient. With this result, we can create our own UISpringTimingParameters with exactly the parameters we desire. This is how we will specify spring animations for all other interfaces. Want to go deeper on spring animations? Check out this incredible post by Christian Schnorr: Demystifying UIKit Spring Animations. After reading his post, spring animations finally clicked for me. Huge shout-out to Christian for helping me understand the math behind these animations and for teaching me how to solve second-order differential equations. Another button, but with much different behavior. This mimics the behavior of the flashlight button on the lock screen of iPhone X. 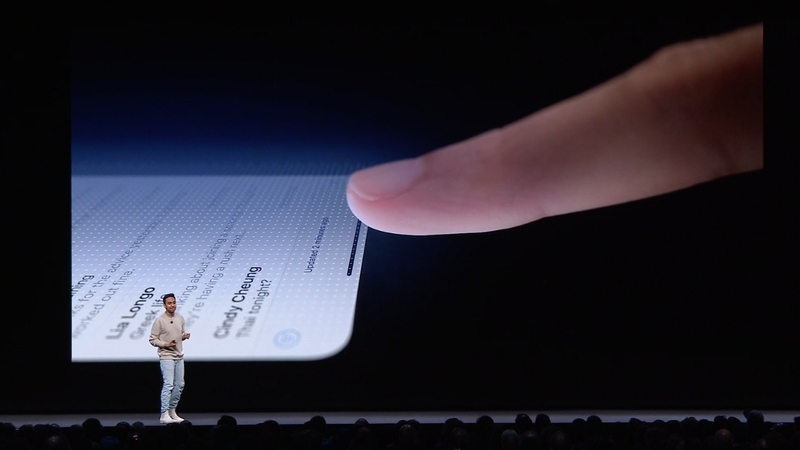 Requires an intentional gesture with 3D touch. Bounciness hints at the required gesture. Apple wanted to create a button that was easily and quickly accessible, but couldn’t be triggered accidentally. Requiring force pressure to activate the flashlight is a great choice, but lacks affordance and feedback. In order to solve those problems, the button is springy and grows as the user applies force, hinting at the required gesture. In addition, there are two separate vibrations of haptic feedback: one when the required amount of force is applied, and another when the button activates as the force is reduced. These haptics mimic the behavior of a physical button. To measure the amount of force being applied to the button, we can use the UITouch object provided in touch events. We calculate a scale transform based on the current force, so that the button grows with increasing pressure. Since the button could be pressed but not yet activated, we need to keep track of the button’s current state. Having the confirmation force be slightly lower than the activation force prevents the user from rapidly activating and de-activating the button by quickly crossing the force threshold. For haptic feedback, we can use UIKit’s feedback generators. Finally, for the bouncy animations, we can use a UIViewPropertyAnimator with the custom UISpringTimingParameters initializers we created before. Rubberbanding occurs when a view resists movement. An example is when a scrolling view reaches the end of its content. Interface is always responsive, even when an action is invalid. De-synced touch tracking indicates a boundary. Amount of motion lessens further from the boundary. Rubberbanding is a great way to communicate invalid actions while still giving the user a sense of control. It softly indicates a boundary, pulling them back into a valid state. Luckily, rubberbanding is straightforward to implement. By using an exponent between 0 and 1, the view’s offset is moved less the further it is away from its resting position. Use a larger exponent for less movement and a smaller exponent for more movement. For a little more context, this code is usually implemented in a UIPanGestureRecognizer callback whenever the touch moves. The offset can be calculated with the delta between the current and original touch locations, and the offset can be applied with a translation transform. Note: This is not how Apple performs rubberbanding with elements like scroll views. I like this method because of its simplicity, but there are more complex functions for different behaviors. To view the app switcher on iPhone X, the user swipes up from the bottom of the screen and pauses midway. This interface re-creates this behavior. Pause is calculated based on the gesture’s acceleration. Faster stopping results in a faster response. Fluid interfaces should be fast. A delay from a timer, even if short, can make an interface feel sluggish. This interface is particularly cool because its reaction time is based on the user’s motion. If they quickly pause, the interface quickly responds. If they slowly pause, it slowly responds. In order to measure acceleration, we can track the most recent values of the pan gesture’s velocity. This code updates the velocities array to always have the last seven velocities, which are used to calculate the acceleration. To determine if the acceleration is great enough, we can measure the difference between the first velocity in our array against the current velocity. We also check to make sure that the motion has a minimum displacement and velocity. If the gesture has lost more than 90% of its velocity, we consider it to be paused. My implementation is not perfect. In my testing it seems to work pretty well, but there is an opportunity for a better heuristic to measure acceleration. A drawer with open and closed states that has bounciness based on the velocity of the gesture. Tapping the drawer opens it without bounciness. Flicking the drawer opens it with bounciness. This drawer shows the concept of rewarding momentum. When the user swipes a view with velocity, it’s much more satisfying to animate the view with bounciness. This makes the interface feel alive and fun. When the drawer is tapped, it animates without bounciness, which feels appropriate, since a tap has no momentum in a particular direction. When designing custom interactions, it’s important to remember that interfaces can have different animations for different interactions. To simplify the logic of tapping versus panning, we can use a custom gesture recognizer subclass that immediately enters the began state on touch down. This also allows the user to tap on the drawer during its motion to pause it, similar to tapping on a scroll view that’s currently scrolling. To handle taps, we can check if the velocity is zero when the gesture ends and continue the animation. To handle a gesture with velocity, we first need to calculate its velocity relative to the total remaining displacement. We can use this relative velocity to continue the animation with the timing parameters that include a little bit of bounciness. Here we are creating a new UIViewPropertyAnimator to calculate the time the animation should take so we can provide the correct durationFactor when continuing the animation. There are more complexities related to reversing the animation that I am not going to cover here. If you want to learn more, I wrote a full tutorial for this component: Building Better iOS App Animations. A re-creation of the picture-in-picture UI of the iOS FaceTime app. Projected position is based on UIScrollView's deceleration rate. Continuous animation that respects the gesture’s initial velocity. Our end goal is to write something like this. We would like to create an animation with an initial velocity that matches the velocity of the pan gesture and animate the pip to the nearest corner. First, let’s calculate the initial velocity. To do this, we need to calculate a relative velocity based on the current velocity, current position, and target position. We can split the velocity into its x and y components and determine the relative velocity for each. Next, let’s calculate the corner for the PiP to animate to. In order to make our interface feel natural and lightweight, we are going to project the final position of the PiP based on its current motion. If the PiP were to slide and come to a stop, where would it land? We can use the deceleration rate of a UIScrollView to calculate this resting position. This is important because it references the user’s muscle memory for scrolling. If a user knows about how far a view scrolls, they can use that previous knowledge to intuitively guess how much force is needed to move the PiP to their desired target. This deceleration rate is also quite generous, making the interaction feel lightweight—only a small flick is needed to send the PiP flying all the way across the screen. We can use the projection function provided in the “Designing Fluid Interfaces” talk to calculate the final projected position. /// Distance traveled after decelerating to zero velocity at a constant rate. The last piece missing is the logic to find the nearest corner based on the projected position. To do this we can loop through all corner positions and find the one with the smallest distance to the projected landing position. To summarize the final implementation: We use UIScrollView's deceleration rate to project the pip’s motion to its final resting position, and calculate the relative velocity to feed it all into UISpringTimingParameters. Applying the concepts from the PiP interface to a rotation animation. Uses projection to respect the gesture’s velocity. Always ends in a valid orientation. The code here is very similar to the previous PiP interface. We will use the same building blocks, except swapping the nearestCorner function for a closestAngle function. 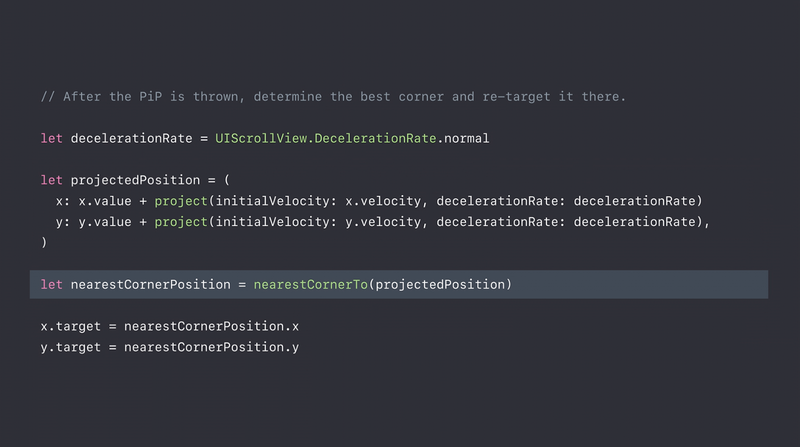 When it’s time to finally create the UISpringTimingParameters, we are required to use a CGVector for the initial velocity even though our rotation only has one dimension. In any case where the animated property has only one dimension, set the dx value to the desired velocity and set the dy value to zero. Internally the animator will ignore the dy value and use the dx value to create the timing curve. These interfaces are much more fun on a real device. To play with these interfaces yourself, the demo app is available on GitHub. The fluid interfaces demo app, available on GitHub! Think about interfaces as fluid mediums of expression, not collections of static elements. Consider animations and gestures early in the design process. Layout tools like Sketch are fantastic, but don’t offer the full expressivity of the device. Prototype with developers. Get design-minded developers to help you prototype animations, gestures, and haptics. Apply the tips from these interfaces to your own custom components. Think about how they might be combined in new and interesting ways. Educate your designers about new possibilities. Many are not aware of the full power of 3D touch, haptics, gestures, and spring animations. Prototype with designers. Help them see their designs on a real device, and create tools to help them design more effectively. Please share the post with your iOS designer / iOS developer friends on your social media outlet of choice. Thanks to David Okun for revising drafts of this post. Thanks to Christian Schnorr and David Okun.